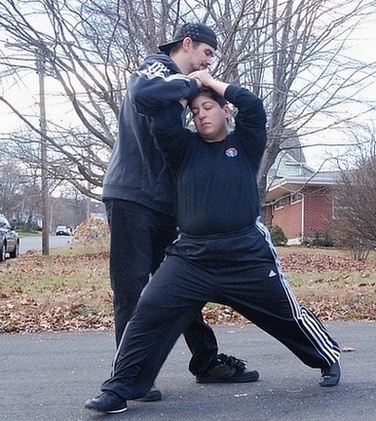 This move is designed for when an assailant grabs your hair from the front to try to pull you into someplace or control you while attempting to strike you. The secret to the move is to get in close and stay low (your belly-button below his on the step thru). Do NOT let go of his hands until you are ready to strike or disengage. Strength is not required for this to be effective. Attacker grabs the top of your hair with one hand (or two). 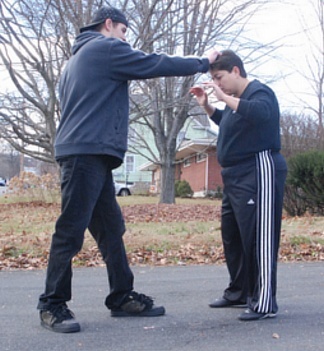 Bring both hands up and grab the attackers hand(s) holding them tight to your head. Keep your elbows in to protect your head from any strikes. (By holding onto your oppenent, you lessen the pain of the hair grab and you control him). 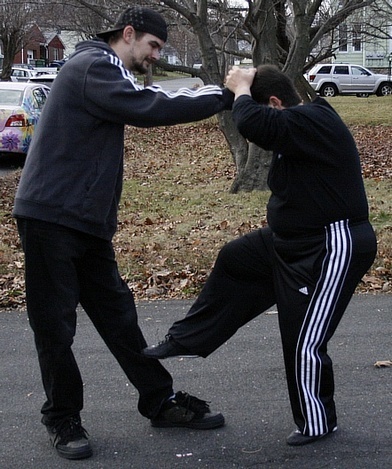 Snap kick with your right foot to the attackers nearest shin to create pain and loosen up his body. Do not bring your foot down, step past his right side (thru the door) while still holding onto his hands. Your buttocks should be facing his right thigh and be close enough to feel him as you pass thru. 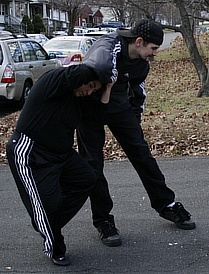 Bring your left foot thru and behind your attacker while turning to face your attackers back. Do not let go of his hands. Stay tight to him. You will now have locked out his shoulder and can start driving him down by pushing the hand your holding towards his head. Follow the momentum that you created and grab his opposite shoulder blade. You can dislocate the shoulder at this point or strike. Your knee is in a perfect position to strike his head. Your hand can strike the back of his neck at the base.